In March, the New Era hat company plans to close its production facility in Derby, NY. This will eliminate nearly 200 high-paying union jobs and devastate this Western New York community. 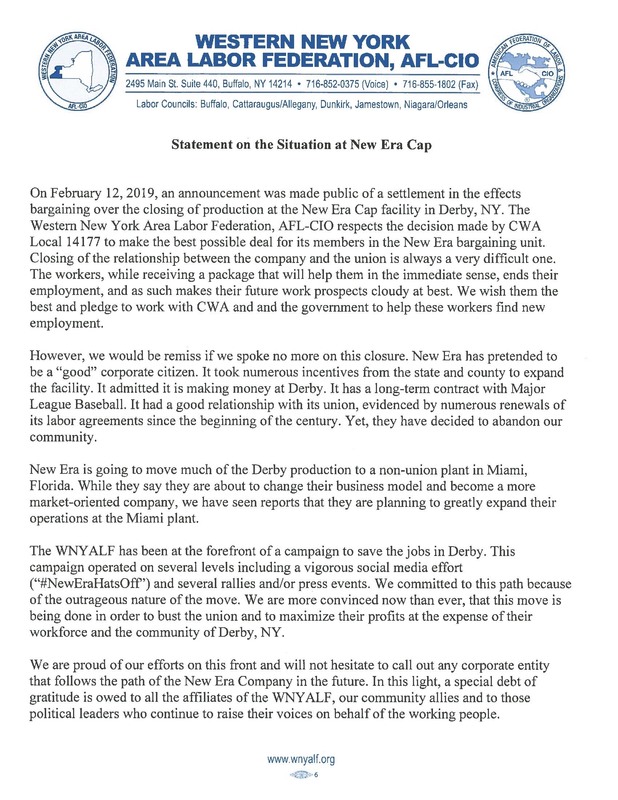 As of February 12th, 2019 an initial settlement has been reached between New Era and the union representing the Derby workers. This fight is far from over! Washington Nationals pitcher, Sean Doolittle took to Twitter with impassioned support for the Derby workers and for the value of union jobs more broadly. The Major League Players Association has issued a statement that they "stand in solidarity with the more than 200 women and men at the New Era plant in Derby, NY, who have made the official on-field caps". Senator Sherrod Brown Is On the Case! US Senator Sherrod Brown (D - Ohio) has joined the #NewEraHatsOff fight by sending a letter to Baseball Commissioner Robert Manfred requesting they apply some pressure to New Era. WGRZ-TV picks up the story of MLB players' latest involvement with the #NewEraHatsOff cause. It started with Sean Doolittle, and now it's going league-wide. "17-hundred retweets and nearly three-thousand likes later..."
#NewEraHatsOff is more than just a hashtag. Take off your New Era hat and throw it down! Post it to social media and send a message to New Era that their actions have consequences. Want to learn more about the New Era factory closure? We assembled a quick fact sheet that helps break down the most important points. Read it. Download it. Share it.